BBC NEWS | Have Your Say | Were you born abroad? The BBC has published the most extensive maps of immigration to Britain ever produced showing where people came from and where they have settled over the years. People move to Britain for a variety of reasons. Most come because of work. Some come as students. Some come seeking refuge and others come through marriage. Were you born abroad and now live in Britain? Why did you make the decision to move to another country, perhaps from the other side of the world? Has Britain been good to you and what do you think about the debate in the UK over immigration? Send us your stories, telling us the name of your home country and when and why you came to Britain. I am a Belgian national, moved to the UK 15 years ago and am now living in the US since last year. I've always loved British culture and find the British much more tolerant than say Belgians! The only thing that bothers me enormously is the drink culture: we never used to go out anymore in our little Northern town on a Friday or Saturday night, too much violence both in the pubs as well as on the street (eg drunk drivers). I can't think of an immediate solution to this problem, but it would make me reconsider our move abroad if things were changing! I was born in Hong Kong to two English-born parents. I am white and British but it never fails to amaze me how many people, when hearing of my place of birth, say "but you don't look Chinese"! I came to live in this country when I was 14-years-old, but if truth be told I find the ex-pat lifestyle much better and more full of English values than I do England itself. Hi, I am British (of Indian) origin, my girlfriend in Bulgarian. I share a flat with an Irish guy, whose girlfriend is Swedish. I love the multicultural mix of London. I am German-born and moved here at 18 to study and work and have stayed ever since with occasional trips to Germany. I very much admire this country's more tolerant and open people and mix of cultures. I am originally from South Africa, I married an Englishman and moved here 5 years ago. I must say that I've never found being an immigrant in England a problem - I don't feel or get treated different here. But interestingly, for instance, my American friends (I used to live there for 3 years) have reported non-acceptance and sometimes outright hostility. This says to me that a people can live quite harmoniously with others if they are not constantly fed negative messages (via the media) about other groups of people! I was born in West Germany whilst my father was serving in the British army and of a Germany mother. I am a British citizen and have served 25 years in the Royal Air Force. I am counted as an immigrant; what utter tripe! I was born abroad - so I fit into this criteria but I'm British and was born as such because my father was working abroad. However every time I want to access a public service I have to prove I'm British because I have to put that I was born outside of Britain on the forms. Let's stop worrying about where people were born and worry about where they'll living and who they are as individuals. Black, white, green or purple I don't care. We all live here and should all be working for the betterment of Britain, our communities and families. Distinguishing where people come from just helps to emphasise the differences. I'm a Canadian living in London. (I have read reports that up to one million Canadians live in California alone in the USA), seem never to figure in these statistical reports. Perhaps there really are fewer Canadians than Sri Lankans in the UK - but I suspect we either fly below the radar, or - as usual, are simply confused with Americans and reported as such. I also suspect these surveys miss a large percentage of the well-paid ex-pat crowd? I was born and raised in Zimbabwe. I left there about five years ago to study in the UK where I lived for just over three years in Manchester. I am currently living in Canada but there is only one place that will ever be home - Zimbabwe. I am a Somalian and I came to Britain 20 years ago to become a surgeon and dreams came true. I work in private hospitals all over the country, but truly the UK is the best country where people can achieve goals in their lives, especially ethnic minorities or shall we say second or third groups etc in UK can be successful if they try hard and I mean working or studying hard enough. Those statistics do not reflect the reality. There are lots of British people that are born abroad; counting them as foreigners is not fair. I have lived in three counties so far, and I would like to be called an immigrant in any one of them. It would be interesting to find out how these figures compare to immigration to other countries such as France, German, America, South Africa etc. My son Max was born abroad in Canada and still holds a Canadian passport as well as a British passport. Both my husband and I are British, but my husband is also a soldier in the British army. Therefore we were posted in Canada when my son was born. So although British, and born aboard holding both nationalities passport, where would he come in the survey? There are many children born in these circumstances. I'm not sure how helpful these figures are. I was born in Hong Kong as my father was in the army out there. Both my parents are British and I have a UK passport but I am counted as an immigrant. Discrimination exists for people who are born abroad and my sister (also born abroad) and I have noticed it, especially when applying for university places. I was born in Pakistan and came here when I was three years old. I cannot think of living elsewhere as England is my home. Also, I believe immigration is not predominantly responsible for the alleged need for more house building in open countryside. The issue is of a change in family lifestyle and culture. Where once families lived together in one household, now people go their own way and lead longer 'single' lifestyles than before. I'm from Hong Kong and moved to Somerset when I was two in 1980. I'm very seriously thinking of emigrating to the US permanently. I barely speak Chinese anymore and speak British English flawlessly. However, when people see me they automatically assume I don't speak English. They talk louder and slower to me. This underlying racism must stop. I have dual British/Canadian citizenship (born in Canada of British parents) but have lived pretty much equally in both countries. I definitely think the UK is getting over-crowded. But I believe we have a duty to help Third World countries. Perhaps the only immigration that should be allowed is to those who have a useful contribution to be make to British society; perhaps take fewer refugees and plough welfare/benefit money they would be claiming in England, back into development aid for their own countries. I think the reason why Australians and New Zealanders have such a high employment rate is that we have no choice. Our visas depend entirely on our ability to obtain work as we have no recourse to public funds like other nations. I was born in Delhi, India and went to university there. After completing my MSc, I came to the UK for a gap year. 34 years later I am happy to be still here and fully integrated within the British society. I would recommend that everyone should have a gap year. I came over from Sweden 2 yrs ago, to be with my English husband to be. Britain has been good to me. I think Scandinavia and the UK are much more alike than different from each other, so settling in wasn't really a problem. It wasn't like I had to change my religion or my clothes. Scandinavia is a good place to be, so we might move there in the future, but for now I really enjoy living in this country. If I crave Swedish meatballs I only have to drive to the closest IKEA store. People here are generally very polite and helpful. I came here in 1999, after completing my Construction-related studies (South African) as many of my friends had come over after completing their schooling. The lack of work opportunities/adequate remuneration were the main reasons for leaving, as was the abundance of skilled positions on offer in London. I have now settled in the UK, have bought my own home and rental apartments, and will continue living here for the foreseeable future. I was born in Somaliland and came to the UK in 1990. After finishing my higher education in London I have settled and work in Essex as a civil engineer. Of course Britain welcomed many immigrant communities to settle here, but these communities are also now vital part of UK economy. London is becoming a global village where almost any race/ethnic/religion is well represented. This diversity has contributed to the economy of this country. Look around and see who are your doctors, nurses, shopkeepers, bus drivers and street cleaners to name but few! You will see many of these people are not UK nationals. Think of the consequences to British economy and health care, should all these foreigners decide to leave or deported to their countries of origin as demanded by some extreme elements who rely on tax paid by these hard working people. This is good news and proves the point that we are one of the most multi-cultural countries in the World and furthermore one where different cultures live together for the very great part in peace and harmony. Immigration is good for our economy too-look at the number of recent immigrants in our rich lists. My husband was born in South Africa (though both his parents are from Yorkshire) and came to live here when he was three. Our daughter was born in New York and came to England at 6 months. However, our son and I were born in England, we all have British Citizenship. Does this make half of my family British and the other half foreign? I'm sure that these statistics conceal many other people in a similar situation who do not consider themselves to be immigrants, in the tabloid sense of the term. These figures confirm an unacceptable amount of immigration. This causes great pressure on the countryside, owing to alleged need for more house building in open countryside. I wish immigration to be reduced to no more than, say, 10% of the current level. I moved from Germany to England simply because I prefer the English language to the German language. I haven't encountered any racism because I'm white (that's what I've been told). I think British people do have a problem with non-white people who do not speak the language properly. I have noticed that British people are more racist towards certain minorities than German people are which I found very surprising. I have now moved back to Germany simply because I missed my family, I still consider England my home away from home. My parents were born in Goa, I was born in Kenya and bought up in Leicester from the age of 2, 38 years ago. I consider myself British, not an immigrant, I pay taxes and contribute to my community. Do I feel accepted as British. Sadly, no. Britain is paranoid about immigration, but without it we would be a backwater nation with no-one to earn money to contribute towards the NHS or schooling. More immigration is needed with reform of the planning laws to provide housing. I came to the UK over 5 years ago from Switzerland. At the beginning it was just for a while to improve my English and work abroad. I met my partner and it looks like I am here for a long while to come. I can't see the Filipino population on the chart anywhere. My girlfriend lives and works here, moving here from Manila. At the recent London Fiesta I think they were expecting in excess of 100,000 visitors - of which I would have thought a large proportion would have been migrant workers - which would certainly make the Filipinos a significant addition to the population compared to others in the list. I was born in Italy to a Greek-Turkish father and an Irish mother. We moved to America in 1985 where my brother and sister were born. We then moved to England in 1989 where my youngest brother was born. I now live in Oxford with my Spanish husband. I suspect that this survey is fundamentally flawed. I was wondering why all the German immigrants until I realised that they are probably mostly people who were born in Germany whilst their parents were there with the British Army. Hardly 'immigrants', but they still account for a quarter of a million people who are classed as such in this survey. I was born in the British Military Hospital in Singapore whilst my father served with the Royal Marines out there and I suspect I would be classed as an immigrant also, even though at least five generations of my family on both sides lived in Doncaster. I was born in Serbia, and came to UK in 2000 on a work permit. I am settled now and applying for citizenship soon. I feel pretty much at home here, although I am not sure if I would like to live anywhere else in UK but Cambridge. I think that people who are against the immigration don't really understand that the diversity is one of the best things in this country, immigration is also good for the economy. Born in the Netherlands, moved to South Africa, moved to the UK, moved to California, moved back to the UK, now moving to Canada. I like the UK but work is happy to ship me around the world. Career prospects in the UK are far exceeding what is possible for me in Holland so that was a major reason for coming across. Next to this, despite the current yob culture, England is still a nice place to live be it expensive. The UK is already massively overcrowded. It is impossible to drive anywhere in the South East without running into congestion. Everywhere there is noise, new housing, fumes, litter and people. This is a small island, and regardless of the race, creed or colour of the incomers, we are full up. Enough. I was born in South Africa and of Afrikaans decent, and moved here 8 years ago. My decision to relocate was fuelled by two factors: the high crime rate and lack of professional opportunities in SA. I denounced my SA citizenship and naturalised as a British citizen - because I felt at home here. In Britain I am respected as a professional and law abiding person here, however the same could not be said in SA. If selected carefully, immigrants could be valuable assets to any country - and herein lies the essence of the immigration debate: Immigrants should be an asset and not a liability to the UK. I am first generation Anglo-Indian. My Dad moved to England to get that all important British qualification as a doctor in the early 1960s, he met my mum and tried to return to India, but were back by the 1980s. My parents opted for my sister and I to have British passports, something we are very thankful for, and a British education. Whilst Britain and British people were never anything other than accepting to my Dad, my sister and I had different experiences in British education, being mixed race. Holland, however was much better to all round. In my school years 1980s-1990s Indian, Pakistani and other migrant children were accepted as equals to British children, however first generation mixed race - the teachers were never quiet sure! On the balance of comments by posters who are 'foreign-born' but 'British' by 'parentage' or 'ancestry' and those who are both foreign born and of a foreign ancestry, what is reflected is how the term 'immigrants' (or at least by definition of the census here) has convoluted what is nationality and what is ethnicity. Why is this distinction important? One of the reasons is that it is quite likely that 'ethnicity' is the one that racist and anti-immigration camps take issue with. For children of the latter category of 'foreign immigrants', such as myself, who are British, it is certainly not our nationality that is the problem. Came here about 10 yrs ago to study and met my husband, a Welshman (met in Malaysia initially) and we settled down in UK. I was a Malaysian but now a British due to naturalization through marriage. We both pay high tax, never claimed a penny on government benefits or services except when I had my baby in an NHS hospital, who by the way, were excellent. I see myself as Welsh and love the country I live in but we are considering migrating elsewhere due to the unfairness with the British laws for law abiding and tax paying citizens like us. I fought hard to stay in the UK because of my husband but I find many recent immigrants are here to live on benefits and majority of them clearly admit to it and not ashamed of their actions. I'm an Australian who moved here for work 8 years ago. I feel there has been too much immigration of late from those who have no interest in contributing to society. I believe that too many people are exploiting the generosity and kindness of Britain and not enough is being done to prevent it. I am returning to Australia this year. My partner is from Portugal and came here on holiday nine years ago. He is now settled in the UK and although he misses the weather he likes many things about Britain. He still supports Portugal passionately when it comes to football though! Originally from SA, I lived in various countries before settling in the UK four years ago. I plan to leave soon, I just like moving on, but England has always been great for me. I've been allowed to work, people are far more open and tolerant here than they are in many other countries I have lived, the services are crumbling but still good and it is probably the best place in the world to shop. The one disappointment are the supermarkets: the big chains dominate the landscape with such a limited and nasty product offering and there are far too independent vendors offering specialist goods. Despite all the complaints, I even like the weather! Does this survey highlight the huge number of people born abroad because of parents in the armed forces? My father was in the army and I was born while he was posted in Cyprus, my sister while we were in Northern Ireland. My grandfather was in the army and my mother was born while he was posted in Malaysia. My grandmother was born in India while her father was posted there. Out of my whole family of seven people only my sister was born in the United Kingdom, and then not in England. Yet we are all English. Does this survey highlight the huge number of people born abroad because of parents in the armed forces? It would be interesting to know how many there are of us, and if this trend continues in other families. I am puzzled by the maps because they show "numbers of people" rather than proportions. If a pixel shows 4001-5000 it is not clear what the total population of the area is or even what the actual geographic area is. I am firstly proudly British, but my birth-place was Jinja, a town at the source of the Blue Nile in Uganda. I am also proud that my fellow Asian Ugandans who fled the Tyranny of Adi Amin Dada in 1970 have not only found refuge and hope in Britain, but have positively flourished. The economic table puts us among the very best of the immigrant social strata, with more high earners than low, and a continuing cycle of success as we instil our hard work ethic onto our children, the second generation who were born in this great country. I don't think where you're born tells the full story. I was born in Manchester of Irish parents, who moved back to Dublin when I was 3, I had all of my education there - have an Irish accent, and carry an Irish passport. I moved to London 5 years ago with work - and get the worst of both worlds - I get comments made because of my accent over here - and then comments from other "Irish people" because I was born in the UK - it appears that neither country wants to claim ownership of me!!! How many of the people mentioned in this report actually have the right to vote in Britain I wonder? Are they all foreign Nationals? Having just filled in the electoral registration forms I find that my wife of 40+ years still has not got the vote either in my country or Norway where she was born. I am from the Philippines who came in UK to be a Project Engineer. My family is now settled in the UK and we are happy to contribute to UK economy with the thoughts that our children are being brought up in a country where there is a lot of opportunities if you give your best. I first moved to the UK from Greece 6 years ago as a student. I now live and work here and I recently married an Englishman. I have no complaints about the way Britain has treated me, otherwise I wouldn't have chosen to live here rather than in my native country. However, I am conscious that I have the advantage of not being obviously foreign (apart from a slight accent). I often get very sad about the narrow-minded and suspicious way people in my adopted country treat immigrants of which I consider myself to be one. We have water shortages, house shortages, traffic congestion, crowded schools and hospitals. There must be a limit to the number of people who can live in our small island regardless of their colour or religion. We have been enriched by this immigration but could we recognise the English as a people in their own right in their homeland too? Could their history and culture be celebrated instead of being pushed to one side? My partner and myself own a video rental store, I have members from all over the world. I like it, it makes life very interesting indeed. I was born in Greece and now live in the UK but I don't feel an immigrant at all. I lived in the EU before and live in the EU now. The nation-state is becoming more and more irrelevant as it becomes easier for people to work abroad. Hopefully, people who were born abroad will soon have the right to vote here in national elections after a reasonable period of residence without having to take up British nationality. They pay taxes like everybody else and it is tyrannical not to allow them a say as to how their money is being spent. I came to England from India during 2001 to work on an IT Project. Since then I have been living here. Britain has certainly been good to me. While I miss India when I am here, I miss Britain when on a holiday to India. I am Brazilian and came to England in 1999 to marry my husband, who is Italian (living here since 1977). I had no problems integrating, I speak very good English and feel accepted by the many people I've met during these 6 years. Can't see myself living anywhere else. I am from India. I work here as an IT Consultant. My wife who is also from India also works as Computer Tutor. We recently bought a house in Bradford and became permanent residents last month. We are happy to be here and we want to make the UK our home. It is enjoyable to have a diverse culture, there is no doubt about that. But in the current climate where we are struggling for space and resources on this small island, as well as a looming pensions crisis, shouldn't we be cutting population growth rather than doubling it through immigration? I was born in the US of A, but had dual nationality as of birth because of my English parents. This flexibility has stood me in good stead and the example of my parents has shown me that allowing controlled immigration for economic reasons pays off in the long run! I am Dutch (Nationality) but was born in what used to be Czechoslovakia. But, although not a British passport holder, I have made my home in the UK and have lived here since 1979 and in London since 1984. I have seen attitudes change towards "foreign" people. Even some taxi drivers (in London) ask me why I am here, in the UK. Many people feel under threat from Eastern Europe as well as the perceived increase in migration from Africa and India. In '79 or '84 this was not so evident. I was born in a beautiful village called Karemlash in the Ninava province (Mosul), Iraq. I arrived in UK in 1981 to pursue my post graduate medical education and training in Paediatrics. Eventually, I liked here, as did my family, and decided to stay. We enjoy life and working here. We made many lovely and good friends here and in Scotland as I worked there for several years. As a white American ex-pat living in London, I've been surprised to learn a lot about British racism. People often tell me there are too many immigrants. When I point out I am one, they say, 'Not you, dear. You don't count.' Sadly, it's obvious that the perceived problem is the arrival of people of a different colour who have unusual customs and languages. I was born in the Punjab in 1963 but moved here with my family when I was a little girl. Since then I have been educated within the English system and trained to be a teacher. I am now a very successful headteacher in a virtually all-white school. I feel that my colour and background make me an excellent role model of a successful Indian Asian woman, who contributes much to the wider community. White children, as well as Indian Asian children benefit from seeing such role models. I was born in England, but moved to Germany when I was 8 months old. I grew up in Germany before coming back to the UK at the age of 20. Population movement and population exchange is too complicated for simply drawing a map. It's a neat statistic, but that's it. It doesn't explain anything. I'm Italian born, but grew up in Holland. I moved to the UK 11 years ago, and have no regrets - British society is actually infinitely more liberal that the so-called "easygoing" Dutch. I was born in Singapore because my South African dad was based there while serving in the British Army. I've never had to face the wide range of problems that many immigrants face - economically, culturally and socially I'm no different from the rest of the UK-born population. I like the fact I was born overseas and it always surprises friends and colleagues, which says more about them than me really. I am originally from South Africa. I moved to the UK just before Mandela came in to power which was about 11 years ago now. Britton is a country with lots of opportunity which makes it very attractive and I think tighter immigration laws need to be put in place before people from around the world start taking advantage! I feel like I've come full circle, although I'm not sure exactly where I fit in to the debate. My grandparents left the UK for Africa in the 30s. I was born in Harare and moved to the UK from Zimbabwe in 1991, mainly to formalise my professional qualifications. Although Zimbabwe will always be a special place for me the UK is now definitely home - it's a great place to live and there are plenty of opportunities if you're prepared to put in a bit of effort. I think people who were born in the UK often don't realise just how good they've got it! I have recently discovered that I now live 1 mile from the house of my great great grandparents so I guess this really is home! I often challenge racist attitudes by saying 'Of course, I'm the daughter of an immigrant' - this takes people by surprise, as I am white British. My mother arrived from the United States in 1939, and I have a brother born in America, a son born in South Africa, a Hungarian sister-in-law, who has grandchildren born in Mexico. Hidden away in rural all-white communities and suburbs are many people who have arrived in Britain from other countries and cultures, who have settled into British life with scarcely a ripple, keeping their own private customs and cuisines unnoticed by their neighbours. Both my parents were born in China. Their parents were Salvation Army missionaries who lived in the British Protectorate in Tientsin. My father's father came from Manchester and my father's mother from Hull. I was born in Hong Kong. I have blonde hair and blue eyes. The large numbers of Finnish women living here must be a result of the trend to have Finnish au pair girls in the late 80s. We had a string of Finnish girls looking after us as children, and at least three of these found love here, and have settled to have children in the UK. I moved to England from the US 9 years ago. I have always wanted to live in England since I was a young teen. However after living here for 9 years the novelty has definitely worn off, I find myself wishing to be elsewhere on a daily basis. Moving from the US to Britain has meant that I have moved down several pegs financially. Whilst for some people moving to Britain has given them a better life it hasn't for me economically speaking. I have however, met a wonderful Englishman that I plan to spend the rest of my life with but we won't be spending the rest of our lives in Britain, we are looking to emigrate to Canada. Having lived in Zimbabwe, Canada and Denmark, I can honestly say that the UK is the best place I've ever lived! The diverse cultures on my street include Japanese, Chinese, Italian, Jamaican, Trinidad and Tobago, Irish and Scottish. My wife (who grew up in the US) and I had planned on staying here no longer than 5 years, but this is home now and we don't plan on leaving any time soon! I was born in Ethiopia, came to the UK 12 years ago and am now a British citizen. I came to join my husband who was also born in Ethiopia. We have two daughters both born in London. Both of us work full time and pay tax in higher tax band. It was actually a surprise to hear today's census that 1 in 4 living in the capital are foreign born. We were visiting New York (US) a couple of weeks ago and we were surprised to hear that 35%+ of New Yorkers were foreign born. The Christian church has more to say on this issue than we realise. In my local church we have seen a growth in diversity which fits with these statistics. We are also learning how to appreciate difference and find a common identity in our faith. I have lived in London for nearly 10 years. Born in Moscow, I came here to further my education and eventually settled here. I go back to Russia on a regular basis, but consider London as my home at present. Although, I consider myself fully integrated here, I might consider moving back to Moscow in few years time or reside in both countries if such opportunity arises. I found your research quite interesting to read...the only thing which might concern me is that since 2001 the figures of immigrants coming to leave here must have changed quite a lot. I was born and brought up in Kenya and had the option to go to a state school and now have been living in the UK for 15 years married to an English man. Which do I consider home? Both countries. I am originally from India. I am doctor and my wife is also a doctor. I came to the UK in 2003 and am working in Bedford hospital as psychiatrist. I was born in Egypt. My parents were in the armed forces. I have lived and worked in many countries and different parts of the UK. The big social change I have noticed in the last 30 years is increased mobility. When I first started work in the UK most of my colleagues had been born, brought-up, worked and retired within the same locality. Outsiders had to work hard to become accepted. Now with the growth of further education many more people leave home to study and later work in other cities and countries. This helps foster an understanding and appreciation of different cultures. This applies to all communities. How accurate is this? I was born in Norway, but have lived in the UK for many years. There must be thousands more Norwegians in the UK. But not a Norwegian in the statistics. Odd. I am Dutch but have lived in Britain since 1995. I married a British serviceman and we lived in Germany for a number of years, hence out of my 3 children only 1 was born in this country while the others were born in the Netherlands as I did not want them to be born in Germany (I went to my old doctor to have my daughters in Holland). Are our children therefore entered in this immigration? That would give a bit of a distorted view as although I am most certainly an immigrant, the kids are not. Funnily enough these days I feel more British than Dutch. The figures are interesting, but they are four years old! A lot has changed even in that short time. As a white, English South African living in the UK for the past 7 years I've never been treaded like a foreigner. Granted my ancestry is British and culturally not that dissimilar (if you discount my occasional cravings for biltong (dried meat). For me the most telling and disturbing thing about this whole immigration debate is how it shows up the underlying racist sentiment in the UK. When I hear Brits talking about immigrants they are always referred to as "them". I was born in Australia. I move here 4 years ago. My wife and I came here because of a job offer. I have the right of Ancestry but the funny thing is I pay my taxes, national insurance, I have the right to vote but my visa says I have no right to public funds. My daughter born here is ineligible for any of the family allowances or similar so we have to fund everything ourselves. How's that for discrimination? I was born in Germany and moved to Britain six years ago as I fell in love with an English man. I can't ever imagine moving back to Germany, I enjoy living here too much! I don't mind immigrants coming to the UK just as long as they pay their taxes like everybody else! My English boyfriend, now my husband, brought me here to do an MBA degree 3 years ago. I am now training as a chartered accountant and will apply for naturalisation next month. England is a wonderful country and my husband says that I have adapted so well to its culture and values that I am more British than him now. I was born in Hong Kong, my father was a senior civil servant in the Hong Kong Government, who worked in HK for 32 years. I know a lot of old 'colonial' families in similar circumstances, where they are ethnically British, but because their parents worked most of their lives abroad, had children where they were posted. The same is true for people who worked for banks, shipping companies, airlines etc. It would be interesting to see how many ethnically British people were born abroad, for what ever reason. I am British and was born in Gibraltar, (which is British territory), but moved to UK four years ago with my English partner as I felt claustrophobic in such a tiny place. Because I'm a British citizen anyway, I've had no probs settling into life in UK, but I have experienced a lot of racist remarks and discrimination because I was not actually born in UK. As someone who has always had a job, owned their own home, and never claimed a penny off benefits, I think the UK should take a harder line with those who exploit the system. Politicians see that the answer to boom and bust is immigration....and the cost is great. Although there are some benefits, my wife is Indian, the social cost of so much immigration must be huge. I moved over here 9 years ago to married an Englishman. I have never regretted my decision as the UK has been very welcoming. My mother was born in Germany in 1952, at Buckeburg RAF base. Technically she was born on British soil as it was a British airbase but she still has the most tremendous problems when it comes to renewing her passport or drivers licence. After living outside of the UK for 10 plus years (in various countries), I found your report on immigration to the UK fascinating. This country has outspoken beliefs of democracy, justice and liberty. Rightly so, people will come here to live because of work, study or refuge. 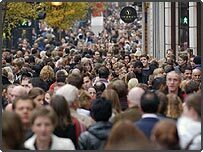 The public need to know more about our global population, in our global world. We have to embrace it or be left on the garden fence. I had to leave Zimbabwe two years ago because the farm that we lived on was taken away. We have our little Zimbabwean community where we live but there is still loads of Zimbabweans in our town that we have never met. Moving to the UK was a hard thing to do. I will always miss Zimbabwe and the way of life we had but I would never go back, it would be too depressing but I will always consider myself a Zimbabwean and I am proud to be one. I'm Danish - I moved here when I was 19. Had my husband (then boyfriend) had the necessary education/qualifications to get a job in Denmark, we would have settled there. Although I love the British culture, I would like to move back home one day and give my kids the same opportunities I had. How can you consider a British service family child to be an immigrant when born to two British parents and having a British birth certificate? My son was born in Gibraltar and would never consider himself anything other than British. Now we find that not only are service children regarded as 'transients' when moving schools within the UK, but they are now considered to be immigrants. Whilst this study is interesting in its findings it only tells a part of the story, what is missing is how many people decided to move from the UK. We, like many others made the move because of the better quality of life offered elsewhere, where is this information being captured? The 'balanced' view should be shown, immigration (from where) versus emigration (to where). How about doing the opposite and seeing where British born people moved to. I question these figures. They must represent legally settled people, as there are definitely far more Zimbabweans living in the UK. Tell me a town with more than a thousand people where there is no Zimbabwean family in England and I will be elected the next pope. The 2001 figures for people in UK who were born abroad indicate that 262,276 were born in Germany and a further 107,002 in Italy. It would be interesting to know whether the parentage of these people was German or Italian, or were they themselves immigrants into Europe? This would paint a better picture of Europe and the movement of people within the EU. To give a more accurate picture of the British population, we would need to analyze the birth rate, immigration, death rate and the migration. This would give a much clearer picture of how the population has grown over the years. Although I was not born abroad, I wanted to raise the question of how many British nationals have migrated out of Britain? Surely British nationals living abroad will also have an effect on immigration stats. Should those born aboard to UK nationals be counted as immigrants? Should those born aboard to UK nationals be counted as immigrants? My father was in HM Services and I was born abroad, and my second son was born abroad because I also served in the Army. But both my son and myself are as English and our family tree can be traced back into the 17th century. It would be interesting to match these statistics with the number of British born people who like myself, have settled abroad. That might also prevent any stirring from the anti-immigrationists. Both my sons were born in the UK in the 1980s. Owing to the UK Passport office strike of 1989, both were given German passports, owing to their German mother. This will reflect in these same statistics, even though they are both British born citizens. The press needs to stop using immigrants as a derogatory term. Immigration is good and healthy and the mixture of cultures can only enlighten people in general. My mum was born in Penang while her parents lived there after the war. My grandparents are Scottish and they moved back to Scotland when my mum was two years old. Are people like my mum included in this survey? Because that would really distort the figures as although my mum was technically 'born abroad' she is by no means foreign or an immigrant.